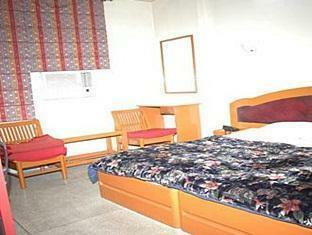 the rooms were not as clean as they looked in the pic., linen could have been cleaner . service was good except the staff could have been educated about its ok to carry electronic copy of the proof of booking. Dirty Linens & congested room - . I paid for an extra bed but they laid a sponge mattress on the floor instead . They said that rooms will be like this only i.e. poor rooms and poor service .The lift has been rarely working . Shall avoid this hotel in future . Location is near a large market in Karol Bagh and staff is friendly but I paid 1500rps/night for a 'deluxe' room which had dirty walls, an old bathroom with cracked toilet and a shower and basin that gave a trickle. The linen was dirty and pillow slips had holes in them. There was no light or air con and the bed was hard, Basic breakfast was served on cracked and dirty crockery. My room was not 'deluxe'.This hotel is overdue for remodelling, it was worth half of what I paid and I'm sure there is better value in the area. the hotel room photos posted in the website do not represent how the rooms really look like. i have paid for a single room with breakfast, expecting a clean modern look and feel but was sorely disappointed with almost every aspect of the hotel. rundown and dirty. there is no lift nor cafeteria. breakfast is a meagre cup of tea and bread served in the room. given its standard, it should cost no more than US$10 / INR450. Je suis scandalisé par cet hôtel. c'était archi-nul, je m'explique : c'était dégueulasse. les murs étaient sales (dans la chambre, le couloir, l'escalier, enfin partout dans l'hôtel), tous les draps tachées (même ceux qui on été remplacés, suite à notre demande), salle de bain douteuse, peintures moisies. et j'en passe. Quasiment pas de lumière, seulement une toute petite fenêtre. La moitié des lampes ne fonctionnaient pas. Aucune couverture. Le service (nous avions le déjeuner compris) a la limite du respect : il entrait dans la chambre avec le plateau sans même frapper !!!. Normalement, le nuitée était affiché à 50 €. en toute honnêteté celà ne vaut pas plus de 10 € maximum. Hôtel assez loin du centre (4-5 kms). Établissement nettement en dessous de prestations affichées, avez vous déjà vérifié sur place cet hôtel ??? als wir ankamen fielen uns sofort mindestens 5 kakerlaken im zimmer auf. wir töteten sie mit spray und entfernten sie im klo. als wir nach dem abendessen wieder kamen lagen ca 30 weitere (halb-)tote kakerlaken im ganzen zimmer. am nächsten morgen waren neue, lebendige kakerlaken im zimmer sogar im bett. wir beschwerten uns beim manager, der sehr freundlich und hilfsbereit war. er zeigte uns andere zimmer aber wir waren nicht überzeugt, dass es dort nicht genauso so ist. also bot er uns an in ein benachbartes hotel umzuziehen ohne weitere kosten für uns. สถานีรถไฟใต้ดิน Karol Bagh - ระยะ 1.09 กม. สุสานหุมายุน - ห่างจากที่พัก 8.84 กม.